The Isles of Scilly seem a bit misplaced 28 miles off Land’s End in Cornwall, England. They sport a mild climate, Bermuda-like beaches, clear waters and palm trees. The tiny archipelago contains 140 islands and rocks, but only the largest five are inhabited. Vacationers travel to Scilly for the gorgeous scenery, silence and a healthy measure of isolation—all wrapped up in British character and local Cornish charm. Picture the English countryside—well worn pubs, winding lanes, stone cottages and dry rock walls—that’s the Scillies. But when you reach the crest of a hill and the panorama opens to exquisite seascape, the islands will surprise you. The locals, or “Scillonians,” are very English, but they have their own personalities. Their soft accent, cheery disposition and snail-like pace of living seem alien to the rest of the UK. The islands have been inhabited since the Stone Age. There is plenty of history to explore alongside the geographical nooks and crannies. Travel to Scilly can be just as intrepid: you get there by plane or boat, and a helicopter service is set to return to the area soon. Hugh Town (pictured above) is the largest settlement on St. Mary’s, the biggest Scilly island. That’s not saying much: St. Mary’s is only a few square miles in total. The Scillonian III, which ferries people and goods from Penzance on the mainland, docks at the Hugh Town quay (pronounced ‘key’). Hugh Town is filled with shops, guesthouses, hotels and restaurants. Boutique knickknack and clothing stores offer everything from designer labels to handmade jewelry, food retailers provide for self-catering holidays and plenty of conveniences like banks and a pharmacy line the way. The three pubs are rough and ready, serving Cornish ales and ciders alongside traditional pub food. On the quay, you can organize sea safaris, boat trips, fishing excursions and other oceanic shenanigans. They fish for all sorts of things in Scilly. Sure, you can go out on a boat for sharks, but chat with the locals and they will tell you the best spots to spin for mackerel from the shore. It tastes better when you put in the work. If the modest Hugh Town is bit much for the misanthropic, Old Town might be more your speed. It is a quieter village on the other side of the island, sitting on its own sheltered bay. The Old Town Inn is a pub with rooms with a wonderful patio for summer drinking and dining. The food here tends to be simple—there’s nothing like eating a hot Cornish pasty on the Old Town beach followed by locally made ice cream. Fresh fish is a staple; Cornish sardines and John Dory are usually found on the menus of Old Town’s cafes and restaurants. Former Prime Minister Harold Wilson was a devotee of the Scillies, and he is buried at the little church in Old Town. The 12th century building reminds visitors of the history alongside the scenery and is much more personal than a big city cathedral or elaborate museum. Tresco is dynamic. The north is moor-like and wild—it even boasts a cave—while the south is marked by beaches and trees. Three English Civil War era castles dot the landscape. Despite the history, they make lovely spots for a picnic with their high-up, sweeping views. Spacious holiday rental cottages are ideal for large groups and families. The New Inn is the only pub/hotel. A warning: there are no street lights, which has resulted in many drivers splayed in the hedges of Tresco at night. But after an evening’s food and drink at the New Inn, someone will normally lend you a flashlight. On the bright side—pun intended—the stars are incredible without the light pollution. There are no cars on Tresco, just tractors and some golf carts, making it even more tranquil, and there’s always a private beach for you, or that “just right” spot on a hill with nothing but the Atlantic making noise. Tresco’s Abbey Garden (pictured above) is built on the ruins of an old priory. It’s famous for hosting exotic plants and flowers from all over the world without the British weather killing them. The climate is sub-tropical, offering winters without snow or frost and higher than average yearly temperatures. Combined with a clever terraced construction, it keeps the conditions consistent. Once you are done with the lush vegetation, you can wander down to the Valhalla Museum. It’s a sobering collection of figureheads and memorabilia salvaged from the myriad shipwrecks around the islands. On the equinox, the tides are so massive you can walk between Tresco and Bryher. The west of Bryher is open to the Atlantic—on a blustery day you can see why the islands are historied with shipwrecks. Watching immense, stormy waves batter the rocks is as enjoyable as a day in the sun. The Hell Bay Hotel is named after one particularly vicious spot, but don’t be fooled, it’s the highest-rated hotel on the islands, with a sophisticated modern restaurant to match its luxurious rooms and spa. Make sure to visit Bryher’s Fraggle Rock Bar for some fresh seafood al fresco. It’s recently become a hot spot for kayaking campers during the summer. 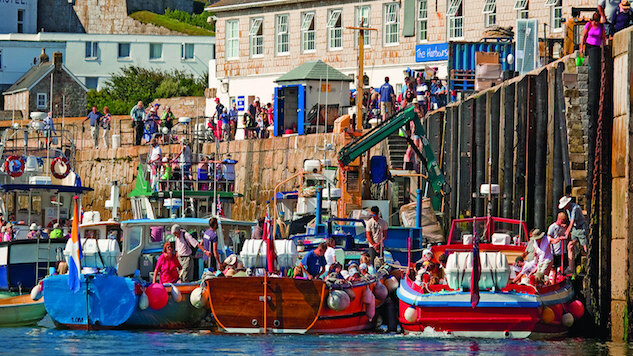 Bryher’s Island Fish Company catches fresh seafood daily; the cool water yields delectably sweet crabs and lobsters. Bread, white wine and a tub of Island Fish’s potted crab—that’s all you really need. St. Martin’s is renowned for its gleaming sandy beaches. Although it’s the third largest island, it’s only a square mile in total. With a population of less than 150, St. Martin’s is a terrific option for those who want a bit of beach quiet. The Karma St. Martin’s is the largest facility on the island. With an exterior designed to look like a row of cottages from the ocean, the interior opposes the deception. It’s a contemporary place, offering top-notch food in a plush island retreat. If you want to sit, drink and chill, the Seven Stones Inn has the view for it. Serving simple fare in a rustic setting, the pub sits atop a hill not far from the hotel. With a book, a pint of Cornish bitter and a jug of steamed shrimp, why worry about anything past lunch? There’s a diminutive vineyard on St. Martin’s—the first vintage in 2000 yielded a staggering 120 bottles. It’s open for tours and tastings throughout the summer. The St. Martin’s dive school attracts a lot of visitors. Famous for numerous shipwrecks and plentiful oceanic critters, the Scillies present some of Britain’s best diving. They’ll even take you snorkeling with gray seals, the gentle puppies of the sea. It doesn’t take long to explore the cairns, stone formations and ancient history of St. Agnes, a common lunch stop on boat tours of the western rocks. The little island is even more rugged than its cousins, with coves and beaches giving way to sparse moorland. The nearby isle of Gugh connects to St. Agnes by a sandbar at low tide only. Don’t test that theory; you’ll get stuck. Visitors can try their luck in Beady Pool, a natural bay where a cargo of beads washed up from a shipwreck in the 17th century. To this day children and parents alike find the odd trinket. And you can’t ignore the Old Man of Gugh, a Bronze Age menhir as mysterious and haltingly solemn as larger monuments on the mainland. The Turk’s Head pub has a brilliant view over the islands. Pop in for a pint or a hot chocolate with brandy. The Cornish pasties are legendary, though it is best to phone ahead and reserve them. The Turk’s Head is a traditional British pub in an uncommon location, but for the view alone, it’s a national treasure.